Being a land of invention and innovation, Germany offers huge employment opportunities for immigrants who wish to work overseas. Germany is a major industrial country and the unemployment rate in the country is very low. The country is the largest economy and stood top in the exporting world. German companies are highly competitive and require large number of highly trained and skilled workers to maintain its labor force. Skilled professionals can immigrate to Germany to fill vacancies in major sectors such as Engineering, IT and Scientific Research in the country. Germany Jobseeker Visa is proposed by Federal Government to attract qualified professionals from overseas to come to the country. Skilled professionals can search for a job in Germany by acquiring Germany Jobseeker Visa. Graduates with a German or other valid university degree or a foreign degree equivalent to a German degree are eligible to immigrate to Germany in search of a job. Germany Jobseeker Visa holders can stay in the country for a maximum period of six months to seek employment. To obtain Germany Jobseeker Visa, applicants must hold a proof of their university degree and demonstrate that they are capable of meeting their expenses during their stay in the country. Applicants filing an application for Germany Jobseeker Visa need not hold a job offer to enter the country. 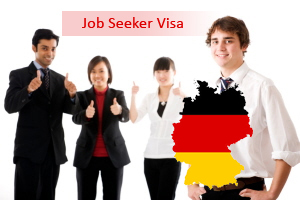 Germany Jobseeker Visa holders can easily acquire Employment visa by attending a personal interview. Applicants of Germany Jobseeker Visa must hold a degree from German Universities or an equivalent foreign degree. Work Experience in the nominated profession will be an added advantage to find work in Germany. Germany Jobseeker Visa permits you to find work in Germany and schedule interview with employers. Germany Jobseeker Visa applicants can file an application for residence permit- Employment provided securing a job.